Students in the class Building Sustainable Communities used Carlisle as a case study. Dickinson College students are hungry to apply what they’re learning in meaningful ways, and local leaders are looking for creative new approaches. So everyone wins when professors tap relationships with community organizations and build original community-based and service-learning academic projects into courses that allow students to give back as they build on their knowledge and skills. Gerhard is pursuing a health studies certificate at Dickinson, a program that requires group community-based research. While past health-studies seminars have studied local employment programs, children’s-menu selections in Carlisle restaurants as well as smoking-cessation and Medicaid-expansion programs in Pennsylvania, this fall’s group, led by Adjunct Faculty in Health Studies Margaret Winchester, partnered with the Sadler Health Center on a project focusing on correlations between health outcomes and self-care skills, knowledge and confidence in Carlisle-area Type 2 diabetes patients. After learning the ropes by inputting health surveys conducted by Sadler, the students developed and implemented their own surveys and developed and administered patient interviews. 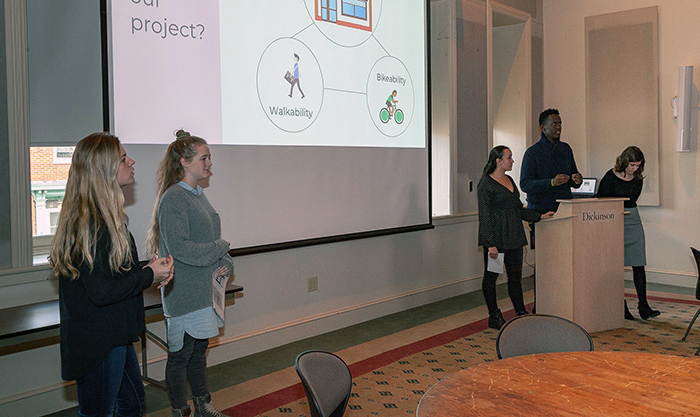 In early December, they delivered an interim report of their findings to the Dickinson community and community partners; the project will continue next semester, headed up by a student research assistant and student volunteers. Students taking Leary's sociology course Building Sustainable Communities used Carlisle as a case study as they learned the characteristics of sustainable and resilient communities and examined approaches to sustainable community development. One group created an asset map indicating organizations that provide workforce-development services, which will be hosted on the Cumberland Area Economic Development Corporation website. Another researched climate-change-induced floods, heat waves and droughts, and local governments’ preparedness for these events and then provided Cumberland County officials with information that will help them update the county’s hazard-mitigation plan. A third group worked with Brenda Landis, a borough councilmember and Dickinson multimedia specialist, to conduct an online survey centering on walkability and bikability in Carlisle and how this affects food access. The town’s mayor, Tim Scott, attended the class’ Dec. 8 presentation on campus. “This experience taught me to learn how to do research in a real-world setting where problems are complex and there's no easy solution,” says Ilana Gruber ’20 (political science). Students in the Social Movements class delivered their presentations before a panel of judges from the U.S. Army War College, Dickinson College and Oxford University. Students taking the Social Movements, Social Media and Global Change course, taught by Visiting International Scholar in International Studies Jacob Jacob, teamed up in small groups and worked to advance social causes by working within a virtual community and launching original social media campaigns. The student group Real People Real Fear sought to openly acknowledge and mitigate the limiting fear of sexual harassment, while students who developed Education for Refugee Sisters advocated for greater access to higher education for all women displaced by violence. Students leading the A House United: Rebuilding Respect project aimed to rebuild respect and create civil discourse around political issues on campus and beyond by hosting “Let’s Talk” sessions. The group also invited campus and community members, and social-media followers in the great world beyond, to sign a petition to "REBEL against incivility." All three of these student groups have posted awareness-raising information on dedicated Facebook pages and held events on campus that raise awareness around their issues of choice, and A House United was featured by ABC27 news and The Sentinel. They presented their final projects to a panel of on- and off-campus community leaders. Analysis and Management of the Aquatic Environment (environmental studies): As they studied the aquatic environment, students traveled to the Chesapeake Bay water basin to observe resource management practices and take freshwater samples for lab analysis. Their findings contribute to knowledge about the health of local waterways, and how best to manage water-quality issues. Fundamentals of Business, Seminar in International Business Policy and Strategy and Marketing in a Global Context (international business & management): Thanks to faculty connections in the local and global business communities and with the Small Business Development Centers at Kutztown and Shippensburg universities, international business & management students begin to apply what they know about best practices from their very first course in the discipline, studying real-life small-business scenarios in real time, and continue that practice in upper-level courses as well. Recent projects include developing marketing strategies for a new wholesale grocery store; previous international business & management classes also researched a statewide health issue and promoted a health fair. Illuminating the Native American Histories of our Community (first-year seminar): During their first semester on campus, students tapped the Carlisle Indian School Digital Resource Center (CISDRC) and attended an Oct. 4 Carlisle Journeys conference to learn about Native American presence in early Carlisle history, an aspect of local life not portrayed in historical signage along the main streets. They've shared what they learned in research posters, which will be on display in the Waidner-Spahr Library throughout the spring semester. Research Methods in Health Psychology (psychology, health studies): Students interviewed clients at Carlisle's food bank, Project SHARE, to determine factors that influence client participation in the organization's cooking and nutrition classes as well as client satisfaction with food-distribution methods. The students will submit a written report of their findings to Project SHARE with the hope of increasing program participation. Spanish for the Health Professions: Students sharpened their cultural and Spanish-language fluency in this class, which paired them with medical professionals who work with Spanish-speaking patients. After adding medical and health terminology to their Spanish-language vocabularies and learning about issues surrounding health care, food security, immigration and cross-cultural healthcare delivery, the students saw these concepts in action while providing vital translation skills. Social Documentary Filmmaking: In this hands-on, intensive documentary production workshop, students used filmmaking techniques to tell the stories of overlooked and underappreciated populations. Students partnered with Project SHARE, Hope Station, the Cumberland County Historical Society, the Dickinson Archives & Special Collections and the U.S. Army War College. Because these opportunities are available to students throughout their time at Dickinson, students like Liam Stenson Ortiz ’18 (biochemistry & molecular biology) can build on their experiences.